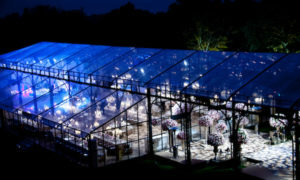 Once you’ve chosen your elegant glass marquee for your wedding, the challenge is to design the interior in proportion to the large scale of the structure. 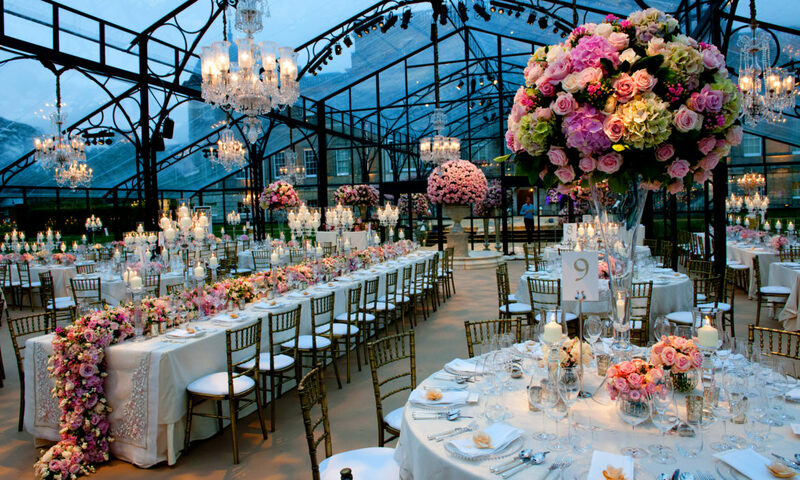 Choices vary from tall living trees placed in the centre of each table, their foliage towering over guests as they sit at dinner; to greenery wrapped around the tent legs to give substance and soften the tent’s structural features; or large crystal chandeliers twinkling overhead to reflect off the clear ceiling to give a feeling of being under starlight; or having oversized tall flower arrangements on a selection of dinner tables, to give texture to the look of the room. Your aim should be to soften the tent’s structural features, and use lighting in a clever manner to create a warm atmosphere for the dinner. Choose a production company who understand good lighting, and the need to draw the eye away from speakers and overhead lighting. 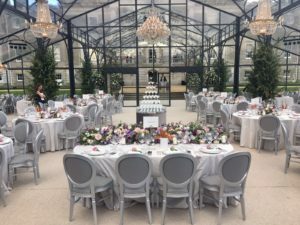 They need to focus the guests’ eyes on the bride’s table, the stage, or the cake positioned on a table in a spotlight. 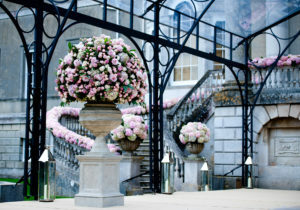 Have fun with outdoor lighting – whether outside is a facade of a stately home, a lake, or a fountain – light these up at night, so your guests can look from the marquee onto stunning features outside. Even more fun is to video project onto these features with a moving animated light show, including personal details and photos of the bride and groom. A tip to remember…the sun can turn your marquee into a greenhouse. So, if you are getting married in a hot climate, add sunshades to your tent’s ceiling, and make sure you have good ventilation, not least for the flowers and greenery which need to look their best on the night of the wedding.